The Peddey family lived in Italy in 2001. The first 2 months were spent with the Simpson family from Melbourne in a beautiful hunting lodge outside Scarperia in the Mujello area of Tuscany. The children attended the local school during this time as we eased into Italian life in a cold Tuscan winter. 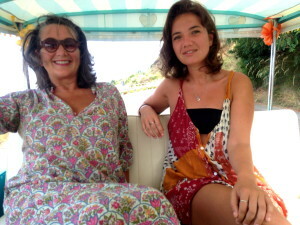 We all travelled to Pisciotta in time for Easter. Our family stayed there for the rest of the year. The children attending local schools, we were quickly drawn into the activities of this community and we have continued to revisit most years since. We finally purchased a house of our own in 2012 – named Casa San Marko after my wonderful husband Mark. In 2015 it was renovated by local designer Vincenzo Avallone. Pisciotta is a traditional medieval village teetering above the Mediterranean on the beautiful Cilento coast in Campania. It is situated in the Vallo Luccano marine and national park – the largest in Italy. The summer is long, warm, sunny and predictable. The perfect anecdote to southern hemisphere winters & fickle European climates. Pisciotta enjoys easy access by car or rail to Mt Vesuvius, Paestum, Ercolano, Pompeii, Naples, the Amalfi coast and Rome. The ferry to Sicily is 3 hours south by train. The beautiful town of Maratea (Basilicata) and the village of Acqua Fredda are south of Pisciotta, just beyond the breathtaking bay of Policastro. Acqua Fredda has two lovely hotels above the beach, the Romantik Hotel and a Best Western. The beach at Acqua Fredda is a lovely small cove with a simple restaurant attached to it. The beach is small and largely private. Paestum is 30 minutes to the north by train. Dont miss these fabulous Greek ruins and the archeological museum. Buffalo milk icecream is nothing to be sneezed at either! If you have a car, the wineries of Cilento in the area close to Paestum are very good. You will often find yourself chatting with the wine maker over tastings of their fabulous Fiano and Aglianico wines. The village of Pisciotta has only one road going through it. To the north it connects to Ascea and to the south to Palinuro. There is only pedestrian access throughout the historical centre of the village. Having to walk everywhere means automatically that you are living differently to how you probably live at home. There is no need to have a car to visit Pisciotta but that said it is nice to have one to explore the beautiful surrounding beaches, wineries and restaurants beyond the village. Very little English is spoken in Pisciotta though you may hear some French, some German and perhaps Swedish. 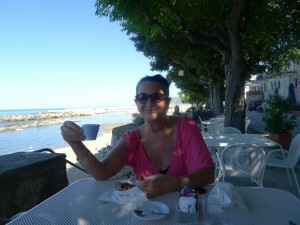 For this reason you must be of independent nature and you will be rewarded with an authentic southern Italian holiday. The main piazza, Piazza Pinto is basically where you will arrive in Pisciotta by car, bus or taxi. It is shaded by large trees and has a choice of cafes and bars. 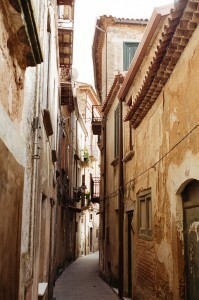 Cars cannot drive through the streets of the historical centre of the village. These pathways were made for mules and pedestrians! The village is quite small. Most of the housing is accessed off these ancient paved and cobbled pathways and stairs. Everyone walks. It really is especially beautiful and ever so quite. A large weekly market selling everything from olives to beach umbrellas is held in Piazza Pinto on Wednesday mornings. The local Farmers Market, is conducted on the stairs of Via Tuvolo twice a week. Local women come down from the hills to sell fresh garden produce, honey, preserves, some small goods and cheeses. It is truly excellent. Get in early to beat the locals! Believe me it is a worthwhile battle! It starts between 0730 and 8 am and its often all over by 11am. Along the road there are three small supermarkets, a very good butcher, an excellent fruiterer and a diligent fisherman who comes Tuesday to Saturday 0830 – 1030. He has all manner of whole fish, and shell fish. This experience is another battle to be had – the restauranteurs , cats, wasps, and home cooks all line up with no concern for order. There is also an excellent fish monger in Marina Pisciotta at the port. They will clean and fillet fish to order – often you will see a whole swordfish or tuna settled on a marble slab awaiting its fate. A store on the stairs from the piazza sells the very special local manaica caught anchovies preserved in salt or oil. There is another store – Surregelati on the corner of Piazza Pinto and Via Forresta (opposite Bar Tre Fontana) which sells frozen fish fillets and whole fish, octopus, calamari, prawns etc as well as vegetables. Just check place of origin on the packaging as it is not all from Italy. I have found the Italian fish is generally very good though. Buffalo mozzarella from nearby Paestum and Cappaccio is delivered fresh each morning. The fresh bread is generally excellent. You really do not need a huge imagination to concoct the most fabulous and easy of meals here! There are many beautiful small and large sand and rock beaches and coves in and around Palinuro, only accessible by private car, boat or taxi. These are a mix of private and public facilities and offer the comforts of restaurants, bars, showers and beach bed and umbrella service at a fraction of the price of more famous areas of Italy. 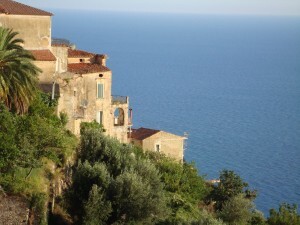 Palinuro is a popular holiday resort for Italians. There is a port at Palinuro which operates boat transfers to Capri and Salerno in the Summer. There are also charters available to visit the breath taking blue grottos of the area. Many of our guests have exclaimed that this has been their most memorable day on the water ever. There is a healthy assortment of restaurants in and around Pisciotta as well as down at Pisciotta Marina, most of them serving either very traditional local food, some modern interpretations, pasta dishes and exceptional pizza of the Neapolitan style all very good and you can choose between them to suit the style of dining you are after, the environment they offer and your budget. Here is an introduction to just some of our favorites. On Via Roma with glorious views to the sea and a wonderful location for sunset with an aperol spritz. Serves Pizza, simple fish, local food and pasta dishes. Popular, local osteria serving simple but delicious fare, great salads and vegetables, grilled and fried fish, and pasta. Be sure to book in the summer months to avoid disappointment. This restaurant is situated about 1 km out of town on the road to Ascea. It is an easy walk but take care if walking back in the dark. The food is very good, traditional fare, includes home made pasta, antipasto, small goods and fish feature highly. Family run, home grown produce. Excellent restaurant fare, verging on fine dining. A delight sitting in the garden beside the sea for lunch or dinner, one of our absolute favourites. Great wine list too. Call Rinaldo – 0974 973 188 for a reservation. Another firm favorite, entirely outdoors, Per Bacco is located in an olive grove above the sea in Marina Campagna. Relatively simple but excellent food. House made pasta, great fish and vegetable dishes and desserts. In the evening the olive wood fire is lit and fish, buffalo, lamb and beef cooked this way are most memorable. Excellent wine list. Pisciotta Marina sits 2km below the village of Pisciotta. A number of restaurants and bars, a hotel or two, some houses, apartments and a few shops line the shaded road in front of a 1.5km stretch of sandy and rocky beach. There is a small port famous for its manaica caught anchovies. These delicacies are potted in salt at the wharf and sold throughout Italy for a handsome price. The walk from Pisciotta to the marina is positively gorgeous in the cool of the morning but the steep return up the hill is excruciating in the heat. You can walk through ancient pathways and stairs from the historical centre of the village below the church, before descending straight down the hill onto a quiet road that takes in olive groves, views of the sea beyond, a pretty church and the village of Pisciotta Marina. It takes about 15 minutes. Alternatively a wander down the gently undulating road takes about 40 – 50 minutes and shows off the best views of the village, the cape of Palinuro, the expansive sea and more olive groves and lemon trees, set amongst the oleander and prickly pear that abounds in the area. 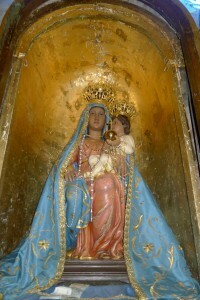 There are 2 churches in Pisciotta and one on the road to the Marina. SS Peter and Paul in Piazza Pagano at the end of Via Roma is truly beautiful and sitting there for a Sunday evening service with the choir and the processions it is a wonderful experience. In the summer there is weekly music program in Piazza Pagano from late June to Mid August. Throughout most of August there are regular memorable nightly performances from the grandstand constructed in Piazza Pinto. Traditional religious festivals run throughout the year. If you are lucky enough to be here for one you will enjoy additional church services, processions and brass bands and sometimes fireworks. Easter and Christmas pageants in Pisciotta are very special. Increasingly there are cyclists enjoying this scenic and relatively quiet route. Most of us access Pisciotta though by train or by car. Train bookings go to: www.trenitalia.com select the English, French, German or Chinese language option from the drop down menu top right of the site. Book to Pisciotta Palinuro railway station. As an indication Pisciotta Palinuro is 2 hours south of Naples, 1 hour south of Salerno and 3 – 5 hours south of Rome by train. If you arrive by TRAIN you get off at Pisciotta – Palinuro railway station. It is about 3km from Piazza Pinto. The line has direct access to Agropoli, Paestum, Salerno, Pompeii, Naples, Rome and Milan to the north and to Sapri (Basilicatta), San Giovanne (Calabria) and Messina, Syracuse and Palermo (Sicily) to the south. Seems to always be open. Perfect for a coffee, a pick me up or a few supplies for the journey. Very friendly. Sells local train tickets too. To get to the village from the station there is an infrequent local bus service and a very reliable Taxi service – book Francesca +39 340 559 4774. She is available throughout the year. Taxi is 10 – 15 euros depending upon the number of people and the amount of luggage. Sometimes there are local people at the railway station offering a lift for about 10 euro. The walk is very beautiful of easy to moderate effort – allow up to 50 minutes. Difficult though with luggage other than a back pack. Car access is possible from Ascea, Vallo and Palinuro. There are two carparks in the village. The free carpark on the northern aspect of Via Forresta on the road in the direction of Ascea ( / Salerno). This is about a 200 meter walk from Piazza Pinto. You can leave your luggage in Piazza Pinto if you like before parking the car. Paid carparking in the 2 level carpark on Via Forresta (close to Bar Tre Fontana which is opposite P.Pinto, by the stairs of Via Tuvolo) in the direction of Palinuro. It is on the left when travelling south. You can purchase parking from Bar Tre Fontana.